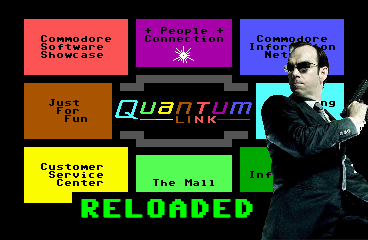 Quantum Link (Q-Link for short) was an online service for Commodore 64 users that started in the mid-80s and ran until Hallowe’en 1994. It later went on to become America Online (AOL). In 2005, the original server (which was accessed via modem over a phone line) was reverse-engineered in Java as a TCP/IP service and released at the SWRAP 2005 expo, where it generated tremendous excitement. Q-Link is again alive and well. Currently Jasmaz is running the only known Q-Link Reloaded server. Instructions on connecting to his server are listed below. His website is here which has more information on the project. Connecting is EASY. There are several methods. For those wanting to delve right in with an emulator, the easiest way to do this is to use the latest WinVICE. Download Winvice Here! Number: +5551212 Note: – & + are switched in vice. press F1 when connection is made. And you will be connected with the C=64 community on irc! Load qlink as normal on your C64. When you get to the screen where you need to hit F1 to log in, you should see the red light on the comet light up when you press F1, and it should log you in shortly thereafter. The Wizconfig tool can just put in q-link.net:5190 it will only take a IP. Awesome, thanks the IP worked, but the url didn’t in vice. Now if I could only figure out how to connect my actual commodores to q-link. i have a 300baud modem but no phone outlets as everything is cellphones and wireless now a days. well, you could always move up to a modern wifi modem. I have them for $20 on this site. fully tested and working with all terminal programs and q-link.